Russian pilot cosmonaut 1960-1968. First person in space. Due to his fame, the Soviet leadership did not want to risk him on another flight, but later relented. Died in a 1968 MiG trainer crash while requalifying for flight status. Status: Deceased; Active 1960-1968. Born: 1934-03-09. Died: 1968-03-27. Spaceflights: 1 . Total time in space: 0.0750 days. Birth Place: Gzhatsk, Smolensk. Graduated from Lyberts School in 1951, Saratov Aeroclub Aerotechnical School in 1955, Voroshilov First Chkalovsk Military Fighter School in 1957. Served in fighter units with the Northern Fleet. Selected as a cosmonaut in 1960, and named commander of the cosmonaut group in 1963 after being the first person to fly in space. Completed Zhukovskiy Military Academy in 1968 but died in a MiG-15 trainer crash shortly thereafter. Call sign: Kedr (Cedar). Family: Cosmonaut. Country: Russia. Spacecraft: Vostok, Voskhod. Flights: Vostok 1, Soyuz 1. Agency: VVS. Bibliography: 5414. 1934 March 9 - . 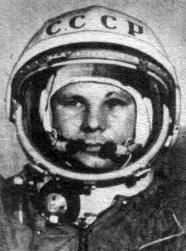 Birth of Yuri Alekseyevich Gagarin - . Nation: Russia. Related Persons: Gagarin. Russian pilot cosmonaut 1960-1968. First person in space. Due to his fame, the Soviet leadership did not want to risk him on another flight, but later relented. Died in a 1968 MiG trainer crash while requalifying for flight status. 1 spaceflight, 1.8 hours in space. Flew to orbit on Vostok 1 (1961). Gagarin in Bulgaria. - . Nation: Russia. Related Persons: Gagarin. His first foreign publicity tour..
1961 May 27 - . Gagarin letter on cosmonaut qualifications - . Nation: Russia. Related Persons: Gagarin. Gagarin has sent a letter to Aviation Marshal A A Novikov, saying that only pilots should be allowed to make spaceflights. Gagarin sees aviation as the first phase of spaceflight, not a separate and different activity..
Gagarin World Tour Completed - . Nation: Russia. Related Persons: Gagarin. Program: Vostok. Flight: Vostok 2. Between 27 May and 7 August Gagarin and Kamanin travel to Czechoslovakia, Finland, England, Iceland, Cuba, Brazil, Canada, Hungary. In July they are at Paris at the FAI, where the records supporting the record flights of Shepard and Gagarin are examined. Kamanin has no time to write up the materials from the tour. Both he and Gagarin are out of the country during preparations for and the actual flight of Titov aboard Vostok 2. 1961 October 11 - . The Gagarin Incident - . Nation: Russia. Related Persons: Gagarin. Gagarin is found at 23:50 at night on the lawn outside his resort hotel in the Crimea, with a big gash in his face and bleeding profusely. 'He's dying' a bystander declares. A doctor is called from the Black Sea fleet, who arrives only four hours later and then does emergency on-the-spot surgery. A tawdry story comes out. Gagarin had slept briefly, then assisted his daughter to bathe at 22:00 and put her to bed. Then he went down to the first floor, where the cosmonauts' wives were playing cards, and his wife was playing chess. Yuri said he was sick of chess, didn't want to play cards, and put on a record. At 23:47 Yuri told his wife Valya, who was still playing cards, 'enough of games, let's go to bed'. Two or three minutes later Valya had finished her hand, and said 'Where's Yuri?' Someone said he had gone down the corridor to the right and went into one of the bedrooms. She found the door locked, and only after pounding on the door, a 27-year old nurse, Anya, opened up. 'Where's Yuri?' Valya demanded, and Anya told her 'Your husband jumped from balcony'. Gagarin had leapt the 2 m to an asphalt surface, but caught his foot in the grape vines against the wall, pitched forward, and hit his face on a cement curb. The nurse said Yuri had entered the room, locked the door, and said 'hey, would you like to get it on?' and started kissing her. - then the pounding on the door came and Gagarin jumped out of the building. 1961 October 14 - . 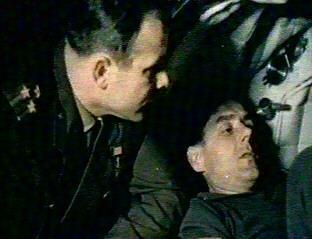 Gagarin recovers - . Nation: Russia. Related Persons: Gagarin. Gagarin needs ten days of healing before he can make a public appearance - and he's scheduled to be at the Party Congress on 17 October. His participation is cancelled. He swears to Kamanin that he will mend his ways and follow the true path in the future. 1961 October 20 - . Gagarin rumours - . Nation: Russia. Related Persons: Gagarin. The American radio is reporting that Gagarin was not at the Party Congress, and is sick. Kamanin confronts Gagarin with the story that is going about that in February he walked from his room to Titov's on the fifth-story ledge of the hotel..
1961 November 29 - . Gagarin Asian tour - . Nation: Russia. Related Persons: Gagarin. Gagarin heads for India and tours the country through 7 December. Millions turn out to see him..
1961 December 7 - . Gagarin in Sri Lanka - . Nation: Russia. Related Persons: Gagarin. Even though Gagarin and his entourage are exhausted, the cosmonaut continues the tour..
1961 December 12 - . Gagarin in Afghanistan - . Nation: Russia. Related Persons: Gagarin. He arrives in Kabul, and the entire city is on the streets for the motorcade..
1961 December 15 - . Gagarin Asian Tour ends - . Nation: Russia. Related Persons: Gagarin. Gagarin is totally exhausted, having had to endure up to nine meetings per day for three weeks..
1962 February 14 - . Gagarin returns from an African tour. - . Nation: Russia. Related Persons: Gagarin. He stays for two days in Cyprus on the return trip from Liberia and other countries..
1962 August 7 - . Vostok 3/4 Launch Commission - . Nation: Russia. Related Persons: Gagarin, Korolev, Nikolayev, Popovich, Rudenko, Smirnov. Program: Vostok. Flight: Vostok 3, Vostok 4. Smirnov, Rudenko, Gagarin attend. Go-ahead is given for launch on 10/11 August. Nikolayev wants to spend one hour in his spacecraft before launch, but Korolev is against this, not wanting the spacecraft disturbed after it has passed all of its tests. Finally a compromise is reached, whereby Nikolayev will get his hour, but without wearing his spacesuit. 1962 August 11 - . 08:30 GMT - . Launch Site: Baikonur. Launch Complex: Baikonur LC1. LV Family: R-7. Launch Vehicle: Vostok 8K72K. Vostok 3 - . Call Sign: Sokol (Falcon ). Crew: Nikolayev. Backup Crew: Bykovsky, Volynov. Payload: Vostok 3KA s/n 5. Mass: 4,722 kg (10,410 lb). Nation: Russia. Related Persons: Barmin, Gagarin, Khrushchev, Kirillov, Kozlov, Frol, Popovich, Smirnov, Ustinov. Agency: RVSN. Program: Vostok. Class: Manned. Type: Manned spacecraft. Flight: Vostok 3. Spacecraft: Vostok. Duration: 3.93 days. Decay Date: 1962-08-15 . USAF Sat Cat: 363 . COSPAR: 1962-A-Mu-1. Apogee: 218 km (135 mi). Perigee: 166 km (103 mi). Inclination: 65.00 deg. Period: 88.30 min. 1962 August 15 - . Landing of Vostok 4 - . Return Crew: Popovich. Nation: Russia. Related Persons: Gagarin, Keldysh, Khrushchev, Korolev, Nikolayev, Popovich, Rudenko, Smirnov. Program: Vostok. Flight: Vostok 4. Recovered August 15, 1962 6:59 GMT. Landed 48:09 N 71:51 E. By 07:00 the temperature aboard Vostok 4 is down to 10 deg C, and the humidity at 35%. Popovich is ready to continue for a fourth day, but he admits the cold is getting to him. Keldysh and Rudenko now support returning Vostok 4 to earth on the 49th orbit, but Smirnov still wants to go for the extra day. Then Popovich radios 'I observe thunderstorms (groza). Groza is the pre-agreed code word to indicate that the cosmonaut is vomiting. It is believed he is declaring an emergency and requesting an immediate landing. The State Commission meets again and has to decide within 40 minutes whether to begin setting the spacecraft up for retrofire. But then when Korolev and Smirnov ask the cosmonaut to verify, he explains "I am excellent, I was observing meteorological thunderstorms and lightning". However Gagarin and Kamanin are suspicious of the explanation - they believe Popovich had an attack of nausea, panicked, made the emergency radio transmission, but then felt better and didn't want to admit to his weakness when confronted by the leadership. However it is now too late. He is set to return at nearly the same time as Nikolayev on Vostok 3. Both spacecraft land successfully six minutes apart a short distance from each other. However flight plans for the State Commission are wrecked due to bad weather at nearby airfields. 1963 January 5 - . Gagarin is in the hospital for an appendix operation. - . Nation: Russia. Related Persons: Gagarin. His wife had the same in December..
1963 March 2 - . Plan for Cosmonaut Training - . Nation: Russia. Related Persons: Gagarin, Kuznetsova, Ponomaryova, Solovyova, Tereshkova, Yerkina. The big question regards Gagarin. Shall the 'Columbus of the Cosmos' be allowed to risk his life on another spaceflight? Most of the Soviet leadership are against it, but Gagarin himself wants to train and fly again. Later in the day the cosmonauts have an idiotic argument with IAKM on high-G centrifuge runs for female cosmonauts. This is the first cosmonaut revolt against the policies and practices of IAKM. Vostok 5 Launch - . Nation: Russia. Related Persons: Bykovsky, Gagarin, Khrushchev, Kirillov, Korolev, Pilyugin, Tyulin. Flight: Vostok 5. Spacecraft: Vostok. At 8 am the State Commission meets and approves a five-hour countdown to launch of Vostok 5 at 14:00. The cosmonaut and his backup have slept well and are at medical at 9:00 for the pre-flight physical examination and donning of their space suits. At T minus 2 hours and fifteen minutes they ride the bus to the pad. A few minutes after Bykovskiy is inserted into the capsule, problems with the UHF communications channels are encountered - three of the six channels seem to be inoperable. Gagarin and Odintsov are consulted on how it will be for the cosmonaut to fly with just three channels operable - is it a Go or No-Go? Go! Next a problem develops with the ejection seat. After the hatch is sealed, a technician cannot find one of the covers that should have been removed from the ejection seat mechanism. It is necessary to unbolt the hatch and check - the seat will not eject if the cover has been left in place. At T minus 15 minutes Gagarin, Korolev, Kirillov, and Kamanin go into the bunker adjacent to the rocket. A new problem arises -- the 'Go' light for the Block-E third stage won't illuminate on the control room console. It can't be determined if it is a failure of the stage or an instrumentation failure. It will take two to five hours to bring up the service tower and check out the stage. But if the rocket is left fuelled that long, regulations say it must be removed from the pad and sent back to the factory for refurbishment. In that case there can be no launch until August. Krylov and the State Commission would rather defer the launch to August. The last possible launch time is 17:00 in order to have correct lighting conditions for retrofire and at emergency landing zones. But Korolev, Tyulin, Kirillov, and Pilyugin have faith in their rocket, decide that the problem must be instrumentation, and recycle the count for a 17:00 launch. The launch goes ahead perfectly at 17:00 - even all six UHF communications channels function perfectly. On orbit 4 Bykovskiy talks to Khrushchev from orbit and good television images are received from the capsule. Bykovskiy reports he can see the stars but not the solar corona. His orbit is good for eleven days. 1963 July 25 - . Gagarin released from the hospital - . Nation: Russia. Related Persons: Gagarin. Gagarin is released from the hospital after his tonsillectomy. .
1963 September 26 - . Gagarin and Kamanin travel to Paris - . Nation: Russia. Related Persons: Gagarin. Gagarin and Kamanin travel to Paris. On arrival they are taken to see the Eiffel Tower and a quick tour of the city, which Kamanin finds beautiful..
1963 September 28 - . Gagarin attends the IAF Congress - . Nation: Russia. Related Persons: Gagarin. Gagarin receives a 20,000 franc prize from the International Astronautical Federation at the 14th IAF Congress..
1963 September 29 - . Gagarin tours Le Bourget airfield. - . Nation: Russia. Related Persons: Gagarin. 1963 October 4 - . Launch Vehicle: N1. Gagarin identified as head of lunar cosmonauts - . Nation: Russia. Related Persons: Gagarin, Tereshkova. Program: Lunar L1. Class: Manned. Type: Manned spacecraft. 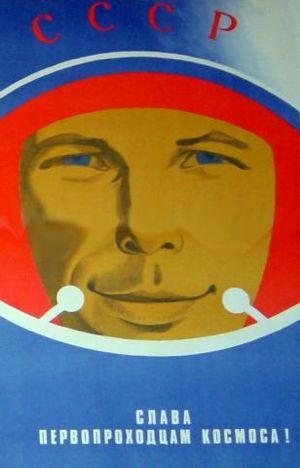 Tereshkova announces in Havana that Gagarin head of lunar cosmonaut team..
Gagarin travel plans - . Nation: Russia. Related Persons: Bykovsky, Gagarin, Tereshkova. Gagarin and Bykovsky will travel to Sweden and Norway in March. Tereshkova's tour of Ghana and Lebanon is an organisational mess, with impossible flight schedules..
1964 March 17 - . 1965 October 4 - . Voskhod 3 - . Nation: Russia. Related Persons: Gagarin, Grechko, Andrei, Keldysh, Malinovskiy, Rudenko, Tsybin, Vershinin. Program: Voskhod. Flight: Voskhod 3, Voskhod 4, Voskhod 5, Voskhod 6. A major programme review is held on plans for Voskhod s/n 5, 6, and 7. Tsybin insists that to conduct all of the experiments requested by the Ministry of Defence will take ten spacecraft and missions, but only five have been authorised. Spacecraft s/n 5 will fly with dogs, on a biosat mission. Spacecraft s/n 6 and 7 are being completed for 15-day flights with two crew, outfitted for artificial gravity experiments and medical and military research. The readiness of the military experiments is very poor, due to the fact that in the past Malinovskiy over and over again prohibited any work on military uses of space, at least until the ideal military platform was developed. It was only on Keldysh's initiative that any preliminary work had been done at all. Kamanin replies to Tsybin that it was not the business of OKB-1 to develop military experiments; this was the concern of the Military of Defence. Yet, Kamanin admits to himself, there is no single organisation within the Ministry that is supervising this work. 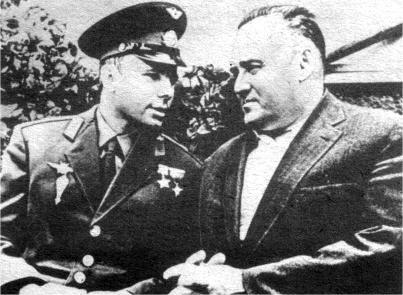 Later Kamanin takes Gagarin to a meeting with Vershinin and Marshal Grechko. The Marshal is unimpressed with Gagarin's understanding of the issues involved in the issue of whether the VVS or RVSN should handle manned spaceflight. Kamanin resolves not to take cosmonauts to such high-level meetings in the future. Grechko does understand finally how poorly Malinovskiy and his deputies have handled military spaceflight. But Malinovskiy, and his supporters, Marshal Rudenko, and Colonel-General Ponomaryov, will not give up in their effort to prevent the VVS from becoming the responsible organisation for military spaceflight. 1965 November 1 - . Soviets losing space race - . Nation: Russia. Related Persons: Brezhnev, Gagarin, Korolev, Tsybin. Program: Voskhod. Flight: Voskhod 3, Voskhod 4, Voskhod 5, Voskhod 6. OKB-1 learns of Gagarin letter - . Nation: Russia. Related Persons: Brezhnev, Gagarin, Korolev, Tsybin. Program: Voskhod, Soyuz. 1965 November 20 - . Military-Technical Soviet of the Ministry of Defence - . Nation: Russia. Related Persons: Gagarin, Grechko, Ustinov. Program: Voskhod, Vostok. Not one new manned spacecraft has been developed in the last five years. Key subsystems - film and photographic equipment, spacesuits, parachutes, communications systems, and oxygen regeneration systems - have only begun preliminary tests in the last year. There is no high-level support for moving space activities away from what Kamanin calls 'the artillery people' - it is known that Ustinov has made his career in building up the RVSN, and he is not about to criticise them. Problems with the Igla system for Soyuz - . Nation: Russia. Related Persons: Gagarin, Korolev, Mnatsakanian. Program: Voskhod, Soyuz. Flight: Soyuz 1, Soyuz 2A, Voskhod 3, Voskhod 4, Voskhod 5, Voskhod 6. Spacecraft: Soyuz 7K-OK, Voskhod. 1966 April 11 - . Popovich incident - . Nation: Russia. Related Persons: Gagarin, Gorbatko, Nikolayev, Popovich. Gagarin, Gorbatko, Nikolayev, Popovich, and their wives went out with delegates to the 23 Party Congress from Kiev. Afterwards an argument broke out between Popovich and his wife when she caught him in an embrace with Gorbatko's wife. Popovich struck his wife in the presence of the others, and her brother punched Popovich in response, giving him a black eye. 1966 August 10 - . Soyuz schedule has been delayed again - . Nation: Russia. Related Persons: Demin, Gagarin, Mishin, Tereshkova, Tyulin. Program: Soyuz. Flight: Soyuz 1, Soyuz 2A, Soyuz s/n 3/4, Soyuz s/n 5/6. Spacecraft Bus: Soyuz. Spacecraft: Soyuz 7K-OK.
Soyuz s/n 1 and 2 will be flown unpiloted by October 1966 Manned flights aboard Soyuz s/n 3, 4, 5, 6 will not take place until the first quarter of 1967. Later Mishin tours the cosmonaut training centre - the first time in his life he has visited the place. Mishin admires the new construction from Demin's balcony on the 11th floor of cosmonaut dormitory, then goes to Tereshkova's apartment on the seventh floor, and then Gagarin's apartment. Mishin insists on drinking a toast of cognac on each visit. Tyulin reveals this is a peace mission - they want to normalize relations and get on with cosmonaut training. At Fedosiya the auxiliary parachute of a Soyuz capsule failed to open during a drop test. Kamanin believes that the Soyuz parachute system is even worse than that of Vostok. His overall impression of the Soyuz is poor: the entire spacecraft looks unimpressive. The small dimensions of hatch, antiquated communication equipment, and inadequate emergency recovery systems are only the most noticeable of many discrepancies. If the automatic docking system does not function, then the entire Soviet space program will collapse in failure. VVS - OKB-1 relations at low ebb - . Nation: Russia. Related Persons: Bykovsky, Gagarin, Mishin, Nikolayev. Program: Soyuz. Mishin invites Kamanin and his cosmonauts to the 20th Anniversary Party of OKB-1. Kamanin is so alienated he refuses to go, and sends only Nikolayev and Bykovsky as cosmonaut representatives. OKB-1 has wasted three months arguing about Soyuz crewing, and essential work to prepare for the flights has either not been done or kept from the VVS. No list of scientific experiments and procedures for the flights, adequate trainers, or information that would allow preparation of flight plans and log books has been provided. A minimum of four months will be required to prepare for flight after all these materials are delivered. Gagarin reports on the farce in sea recovery training at Fedosiya. It took eight days instead of the three planned to train 16 cosmonauts. Only after the VVS cosmonauts had left did Mishin sent 8 OKB-1 cosmonaut candidates, who were prohibited from training together with the VVS cosmonauts. Cosmonaut leave cancelled to support Soyuz missions in December - . Nation: Russia. Related Persons: Gagarin, Mishin. Program: Soyuz. Spacecraft Bus: Soyuz. Spacecraft: Soyuz 7K-OK.
Mishin claims he will be ready to fly two piloted 7K-OK spacecraft in the second-half of December 1966. No one but Mishin believes this is possible. The tests of many subsystems are not finished, with the parachutes and ECS far from completion of qualification tests. However in order not to give Mishin any excuses, Kamanin orders Gagarin to cancel all cosmonaut leave for the rest of the year, and to accelerate training to be ready for Soyuz flights by 1 December. Cosmos 133 - . Nation: Russia. Related Persons: Belyayev, Gagarin, Kerimov, Mishin, Nikolayev, Rudenko, Yegorov. Program: Soyuz. Flight: Soyuz 1, Soyuz 2A. Spacecraft Bus: Soyuz. Spacecraft: Soyuz 7K-OK.
Four years behind Korolev's original promised schedule, the countdown is underway for the first Soyuz spacecraft. A new closed circuit television system allows the rocket to be observed from several angles during the final minutes. Mishin, as per tradition, personally stays with the rocket until the last moment. Rudenko, Kerimov, and Kamanin observe the launch from the bunker, while Gagarin, Nikolayev, Belyayev and Yegorov observe from the observation post. The launch is perfect, within 0.2 seconds of the 16:00 launch time. The separation of the first stage strap-ons can be seen with the naked eye in the clear sky. The spacecraft is given the cover designation Cosmos 133 after launch. By 22:00 the spacecraft is in deep trouble. For unknown reasons the spacecraft consumed its entire load of propellant for the DPO approach and orientation thrusters within a 15-minute period, leaving the spacecraft in a 2 rpm spin. At the insertion orbital perigee of 179 kilometres, the spacecraft will have a life of only 39 orbits. It is decided to attempt to stop the spin on the 13th orbit using other thrusters and the ion flow sensors to determine attitude. Then the re-entry sequence will be commanded on the 16th orbit, with the spacecraft to use solar sensors to orient itself for retrofire on the 17th orbit. No sign of Cosmos 133 - . Nation: Russia. Related Persons: Gagarin, Kerimov, Mishin. Program: Soyuz. Flight: Soyuz 1, Soyuz 2A. Spacecraft Bus: Soyuz. Spacecraft: Soyuz 7K-OK. The search for the wreckage of Cosmos 133 continues without success. Mishin and Kerimov agree with Kamanin's opinion that if a cosmonaut had been aboard instead of a mannequin, the mission could have been successful. Kamanin has temporarily removed Gagarin from flight status after he missed a Tu-104 flight debriefing, then a 22:30 curfew, and did not show up at the Cosmonaut Dormitory at Tyuratam until 14:00 the next day. While on his escapade he also was found to have driven an automobile while intoxicated. 1966 December 20 - . Americans have understood true purpose of Cosmos 133 mission - . Nation: Russia. Related Persons: Gagarin, Nikolayev. Program: Soyuz. Flight: Soyuz 1, Soyuz 2A. Spacecraft Bus: Soyuz. Spacecraft: Soyuz 7K-OK.
Kamanin meets with key personnel of the TsPK and explains the reasons for the Soyuz incident, noting inadequate understanding of the abort systems. Kamanin orders improved medical examination of cosmonauts immediately after flight at the recovery site. Gagarin and Nikolayev request that the Soyuz crews now be allowed to take leave. Reports in the American press show that their experts have correctly interpreted the true nature of Cosmos 133 as a manned precursor mission. The American press alleges that there were two other explosions of the spacecraft in the USSR during September and October. Soyuz state commission - . Nation: Russia. Related Persons: Gagarin, Mishin, Smirnov. Program: Soyuz. Flight: Soyuz 1, Soyuz 2A. Spacecraft Bus: Soyuz. Spacecraft: Soyuz 7K-OK. The Soyuz 1/2 crews had planned to depart for Baikonur on 30 March, but Mishin wants to push this forward to the night of 17/18 March. This disrupts all of Kamanin's training plans and shows the poor planning and work of Mishin and his followers. A Soyuz state commission is held. Kamanin doesn't trust Mishin. The spacecraft is unreliable and incompletely tested. But it is decided all the conditions exist for a launch of the mission on 20-25 April. The question of Gagarin flying on the mission is brought up. The Communist Party says he is too valuable to risk on further spaceflights. Kamanin is against making him a living 'museum exhibit'. Smirnov agrees to raise the matter with the Politburo. State Commission on Soyuz 1 crash. - . Nation: Russia. Related Persons: Afanasyev, Sergei, Gagarin, Serbin, Smirnov, Ustinov. Program: Soyuz. Flight: Soyuz 1. Spacecraft Bus: Soyuz. Spacecraft: Soyuz 7K-OK.
Soyuz 1 Commission report is reviewed. - . Nation: Russia. Related Persons: Afanasyev, Sergei, Gagarin, Kerimov, Tyulin. Program: Soyuz, Lunar L1. Flight: Soyuz 1. Spacecraft: Soyuz 7K-L1, Soyuz 7K-OK.
Afanasyev, Kerimov, and Tyulin object to Kamanin's conclusion that problems exist with the automated landing system and that a manual backup is needed. They want to find fault only with the parachute. The findings of VVS LII, and TsAGI are discussed. Later Kamanin has an unpleasant conversation with Gagarin. He wants to remove control of the manned flight control centre away from the MOM. Kamanin believes this is contrary to the interests of the Ministry of Defence. 1967 August 8 - . Gagarin grounded. - . Nation: Russia. Related Persons: Feoktistov, Gagarin. Program: Lunar L1, Soyuz. Spacecraft Bus: Soyuz. Spacecraft: Soyuz 7K-L1. The Soviet leadership has decided Gagarin is too important a propaganda asset to take any risks with his life. He is removed from the list of cosmonauts to be selected for space flights, and will be allowed to fly aircraft only with an instructor aboard. This ruling overrules a promise made by Kamanin to Gagarin that he would be put back on the flight rosterthat after he obtained his engineering diploma from the Zhukovskiy Academy on 1 May 1968. A vote is taken of the cosmonaut selection commission on Feoktistov's fitness for duty. The vote is 4:4, but then a quorum of at least 12 commission members is demanded. Feoktistov passes 9:8 in the final vote. 1968 March 12 - . Cosmonaut meeting at Yevpatoriya. - . Nation: Russia. Related Persons: Gagarin. Program: Lunar L1. Spacecraft Bus: Soyuz. Spacecraft: Soyuz 7K-L1. Gagarin wants better organisation of the TsPK for the L1 circumlunar manned flights, including: better training in manual navigation in case of failure of automated systems; improved training in survival of 20 G re-entries if the automated SUS capsule guidance system fails. The cosmonauts review material for the Seventh International UFO Conference in Mainz (!). Death of Yuri Alekseyevich Gagarin at Novoselovo, Russia. Crash of MiG-15 trainer. - . Nation: Russia. Related Persons: Gagarin. Program: Lunar L1, Soyuz. Russian pilot cosmonaut 1960-1968. First person in space. Due to his fame, the Soviet leadership did not want to risk him on another flight, but later relented. Died in MiG trainer crash while requalifying for flight status. 1 spaceflight, 1.8 hours in space. Flew to orbit on Vostok 1 (1961). 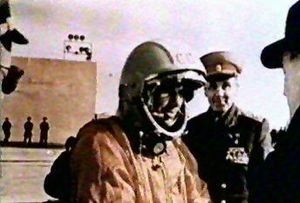 Gagarin was flying together with instructor pilot Sergin on a flight in a UTI MiG-15 trainer. Gagarin was being requalified as a jet pilot after being denied flight status by the leadership for a long time. At that time the mean flight hours between fatal accidents hours for Soviet jet fighters were: MiG-15, 18,440 hours; MiG-17, 11,460 hours; MiG-19, 4,475 hours; MiG-21, 4,422 hours; Su-7, 2,245 hours; Su-11, 2,100 hours. Gagarin's UTI MiG-15 s/n 612739 was built at the Vodokhod factory in Czechoslovakia and delivered on 19 March 1956. It had a 2100 hour airframe life, and had flown 1113 hours. It had two overhauls to date: one on 13 July 1962, after 13,834 'mil' hours, and the second on 30 March 1967, after 36,986 'mil' hours. It should have had a 500 hour life after the second overhaul, had flown only 62 hours since then, and had 438 hours left. 1968 April 8 - . Further MiG-15UTI crashes - . Nation: Russia. Related Persons: Gagarin. MiG-15UTI trainer crashes are reported from Algeria and Hungary. They are to be investigated - could they be due to some common problem that also killed Gagarin?. 1968 April 10 - . Cosmonauts occupied with Gagarin crash investigation - . Nation: Russia. Related Persons: Gagarin. Program: Soyuz. No cosmonauts will be sent to witness the next series of unmanned Soyuz flights beginning on 14 April. All cosmonaut staff efforts are concentrated on the Gagarin crash investigation. Kamanin notes the flight of Apollo 6. According to his information the first manned Apollo flight will take place in May-October 1968, and the first American moon landing by the end of 1969. 1968 April 26 - . State Commission on the Gagarin crash. - . Nation: Russia. Related Persons: Gagarin. The course and manoeuvres taken by the aircraft in its last minutes has been determined from radar data and the on-board recorder..
1968 May 4 - . Gagarin survivor benefits - . Nation: Russia. Related Persons: Gagarin. 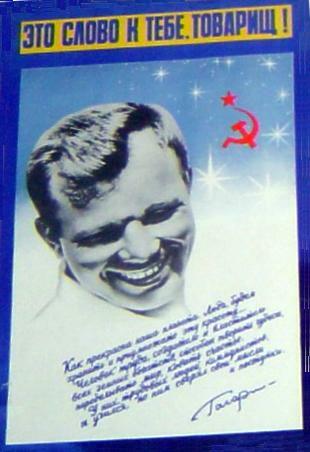 It is decided that the TsPK will be named for Gagarin. Meanwhile 400 soldiers and 50 officers have combed the Gagarin crash site, recovering pieces of the aircraft. Gagarin's widow will receive a one-time payment of 5000 roubles, plus 200 roubles/month pension, plus 100 roubles/month for Gagarin's daughter. This is in addition to base amounts of 150/month for the widow and 75/month for the daughter. 1968 December 11 - . Kuznetsov is being blamed for the Gagarin crash. - . Nation: Russia. Related Persons: Gagarin, Kuznetsov, Nikolai F. First he wouldn't allow him to fly at all, then he let him go aloft without adequate retraining..
1969 March 27 - . 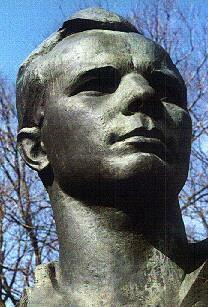 Gagarin remembered - . Nation: Russia. Related Persons: Gagarin. 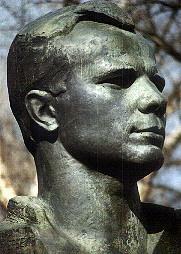 Day of remembrance of Gagarin on the anniversary of his death in a plan crash..
1969 April 5 - . Kaluga visit - . Nation: Russia. Related Persons: Gagarin. Kamanin and the cosmonauts go to Kaluga on a two-day visit to formally hand over Gagarin's flight log to the space museum there..
1970 October 26 - . Gagarin documentary. - . Nation: Russia. Related Persons: Gagarin. Leningrad Television is making a program about Gagarin. People are coming out of the woodwork that knew him or claimed to have known him. New facts are expected to emerge..